I am Aki,a new blog member from Cairo and I have been working at Japan culture center in Cairo since this April. However,This is the third time for me to live in Cairo. So I feel at home here. Speaking of Egypt, the revolution in January is still fresh in our minds. You might worry about worsening security in Egypt. 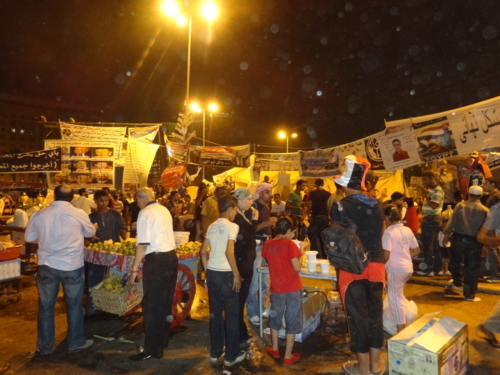 So I would like to show you some pictures from Taharir Square, the center of revolution. Is this a picture of summer festival? It’s a demonstration in Taharir Sq ,lined with food stalls, Egyptian families come together and walking around to listen revolution songs and speeches and poet readings and so on. 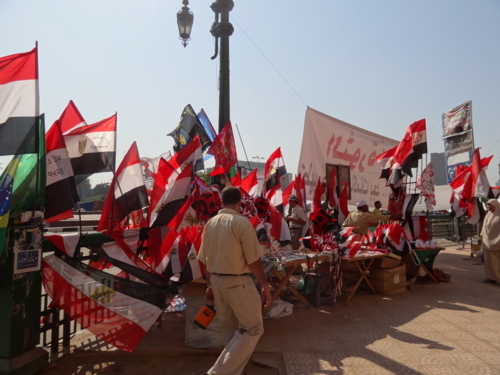 but now they are selling revolution goods in Taharir Sq.new landmark(?) in Cairo. Now I am going to report you three topics from Japan culture center in Cairo. We have held “Kids Japanese course” (8 lessons total) since 3rd of July. This is special course for kids to learn Japanese and Japanese culture trough games and singing and dancing. 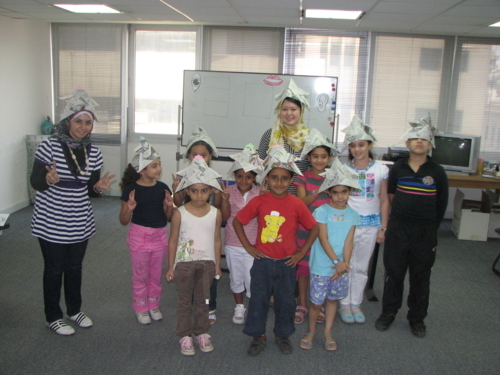 24 Egyptian kids from 6 to 12 years old have enjoyed Japanese lesson. such as shopping game and FUKUWARAI and singing and dancing. The second topic is IGO. Egyptian IGO club was formed on 19th of May. and enjoy playing IGO together. Chess is very popular in Egypt. But I couldn’t expect they are so fascinated by IGO too! The members are getting better day by day, so Egyptian IGO player would play in the world tournaments in the near future. The last topic is interview from TV program. We had interview from Channel1.They also did a shoot of Japanese language lesson. It is going to be a special program for Ramadan to introduce Japan. Ramadan will start soon. How Egyptian Muslim will manage Ramadan in midsummer? I am going to report it next time.